Start at Katherine – one of the main stops on the Savannah Way – to see what lies ahead on this famous Australian track. Sitting at the southern tip of Kakadu National Park, the Nitmiluk National Park is home to some of Australia’s natural wonders. The Leliyn (Edith) Falls cascade year round, and provide a great spot to laze the day away. Perhaps the main drawcard to the region, though, is the eponymous Katherine Gorge. Katherine Gorge is actually made up of 13 gorges that dot the Katherine River, and are joined by rapids and waterfalls of varying size. Each has its own personality, and while there may be some crocs around, they’re only going to be the non-man-eating freshies. 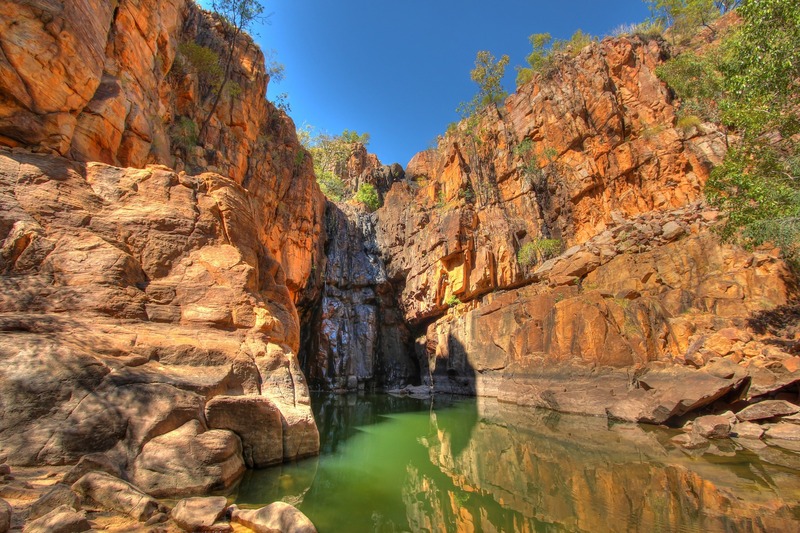 After taking a refreshing dip in Katherine Gorge, you might be up for a nice warm bath. Well, Mataranka can do you one better. How about soothing away the aches and pains of a day’s hike in the almost shockingly clear, warm thermal pool? The natural sandy-bottomed spring will have you calm, relaxed and ready for more. About half a day’s drive to the west will bring you to the Limmen National Park, where you’ll find the ancient ‘Lost City’ –a range of sandstone outcrops and formations, some 1.4 million years old, that give the impression of a bunch of very organic-looking high-rises. Crossing the border into Queensland, your next stop is Burketown, and if you don’t know who it’s named after, you have either just been born, or you were seriously not paying attention during history class! Along with his compatriot, William John Wills, a certain Robert O’Hara Burke was the first colonial explorer to successfully complete a south–north crossing of Australia, during 1860 and 1861. This makes it a pretty great place to stop and revel in your own achievements as an explorer along just some of the stops along the Savannah Way.